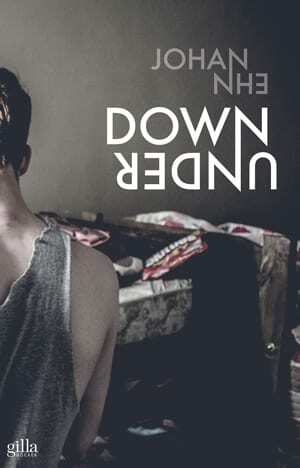 Down Under is an autobiographical novel for adults and young adults. It shares a story about not fitting into this world, about finding yourself on the other side of the world. 1987. Nineteen year old Jim has created a bit of chaos back home in Stockholm, both for himself and for the people close to him. He decides to escape it all an run away as far away as possible – to New Zealand – to start anew and become ”a better version of himself”. He moves in with his uncle and aunt, gets a job driving a forklift truck at a sandpaper factory and slowly starts to build up an everyday life in his new country. But it’s not without complications. He is tormented by memories of the life he’s left behind and his unpredictable, conservative uncle runs his house with an iron hand. One day Jim’s aunt picks him up at work offering him a ride home. But she stops outside a hostel and tells him all his belongings are in the trunk of the car. She and her husband have read through his mail and realized that he is ”a homosexual”. They never want to see him again. Jim is left on the curb with his belongings dumped into plastic bags. This marks the start of a turbulent inner and outer journey lined with self loathing and confusion. But along the way Jim also encounters wonderful people, and finally he has the courage to look back at everything that has been happening – leading up to him finding himself on the other side of the world – down under.